Edraw has the most extensive collection of organization chart features, including a variety of different shapes, connectors, layout options, and design options. Here is a brief beginner's guide for making organizational chart. When Edraw opens, all you need to work with is the one titled Template Categories. On the Template Categories list, click the Organizational Chart category. All of the libraries in the organizational chart category appear in the central window. 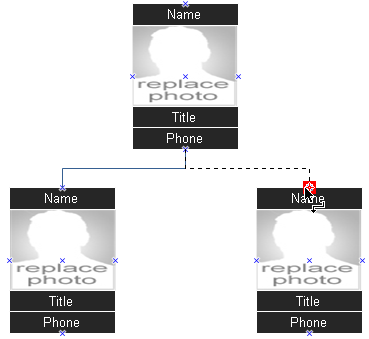 Double-click the template titled Photo Organizational Chart. When the Organizational Chart Shapes library opens, most of the space is taken up by a blank drawing page. Because it is important to line up the shapes when you create a diagram, the page appears with grid lines on it. Traditionally, organizational charts were drawn with a template and a ruler. Now, however, the process becomes much easier with Edraw. 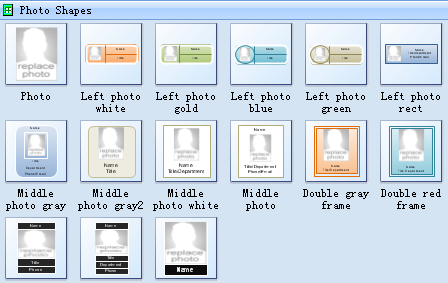 Right-click the organization chart shape you want to add a picture to, and then click Replace Photo. 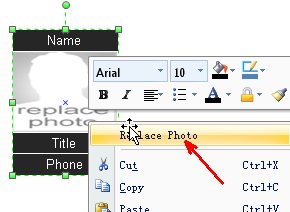 In the Insert Picture dialog box, locate the folder that contains the picture you want to insert, and then click the picture file. It's easy to connect organizational chart shapes in Edraw. On the Home tab, in the Basic Tools group, click the Connector tool. To create a smart connector you need to point the cursor at any connection point of the shape. The connection point will be highlighted red. Sometines, a dottedline is needed. Click here to learn how to add dotted lines to org chart. Or you can open the Frame Shapes in the Organizational Chart Category. The design of your organizational chart depends on the type of organization. Some organizations are described as "flat," meaning that many people report to a single person at the top of the organization. Others are more vertical in nature with a few people reporting to the top. In some organizations, departments or organizational units are similar in size; in others, there is considerable disparity in the size of the various organizations. Design of your organizational chart is made more difficult if there is a great deal of variation from department to department. Organizational charts can list both titles and names of specific personnel. In a large organization, they may simply list the title with the number of people assigned to that title in that department. For example, under computer department, you might see the following functions: Software Engineers (25), System Administrator (2), Computer Support Specialist (12). If names are required, they can be listed separately by department and function. The following images are created with the Edraw org chart software. You can find more examples in the example gallery. Let's make a sample organizational chart for a small organization. Let's imagine a small manufacturing company, Acme Ballet Shoes for the Coordination Challenged. Acme has twenty-five people on its staff. At the top of Acme's hierarchy are the President and Chief Operation Officer. The president has an Administrative Assistant who reports only to him. Place a box to one side of the President's box, but make it smaller than that of the President. On a piece of paper or on your computer screen laid out horizontally (landscape), place a box with his/her title, followed by his/her name or the number one. Two vice presidents report to the president. Add two boxes for Vice Presidents under the President's box and label them "VP of Operations" and "VP of Sales and Marketing", respectively. Production, Quality Control, Shipping, and Receiving report to the VP of Operations. Place a box for each of these departments under the box for VP of Operations. As you might guess, the Sales and Marketing departments report to the VP of Sales and Marketing. Place the name of the supervisor for each department in its box. Note that the Shipping and Receiving, although separate departments with discrete functions, have the same supervisor. Show his/or her name in both boxes. Create a small box for each staff member in each of the departments, and list his or her name in the box with his/her title. 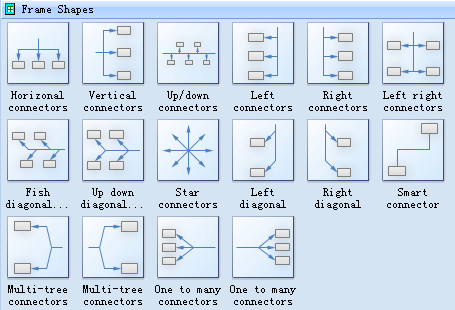 Connect the boxes with lines to show the relationships and to complete the "tree branches". We've forgotten one person, the company Accountant, who reports to both the President (for accounts payable and receivable) and to the VP of Operations (for purchasing and inventory). Place the accountant's box between the President and VP of Operations and connect him/her to each with a dotted line. Dotted lines are used to show dual reporting structures within an organization. For example, a person may be assigned full-time to a specific department, but have a "dotted line" relationship with another department or organization. The process is similar for a large organization, but names are not listed on the chart. However, each title will likely show a head count next to the title. Also, any vacancies are specified on the chart. A very small organization will possibly fit on one piece of paper. Other organizations will require oversize (8.5" x 14" or 11" x 17"). To create or print an organizational chart on standard 8.5" x 11" letter size paper, the chart will need to be broken into discrete units, usually divisions (groups of departments) or departments. Typically, the executive positions are listed on the first page of a multi-page chart. Pages should be numbered and the charts should be annotated, similar to the annotation in a map book, to show the chart to which a section connects. Finally, you can use box size, line weight, and color to show relationships and to make your chart easier to read. The organizational chart is a tool used by both managers and staff to document and better understand relationships and functional roles within and organization. Discover why Edraw is the optimal org chart software: Try it FREE.